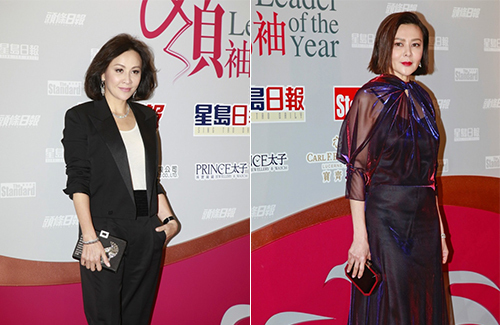 The ice is still not broken between Rosamund Kwan (關之琳) and Carina Lau (劉嘉玲). Their rift started in late 2015, when Rosamund was going through a split with her ex-husband, Chen Tai-ming (陳泰銘). Tabloids published photos of Chen going on a hike with Carina, which angered Rosamund, leading her to rant about Carina’s insensitive attitude to the press. Carina responded with confusion. The two actresses remained estranged to this day. Both Rosamund and Carina were invited to attend the 2016 Leader of the Year Banquet last night. Whether it was by accident or by design, Rosamund and Carina arrived five minutes apart from each other. Reporters were unable to get the two actresses to pose for photos together.